A major part of being green, to me, is compassion. If we care enough about our beautiful, fragile planet to want to save it, then we should, in my eyes, care about all the creatures that make our world so amazing. However, the downside of being environmentally friendly is that you can’t save everything. You can’t mend it all. But you can do a little bit, change things by example and make your life as green as possible so that it permeates the lives of others. We have numerous high fuluting plans for this new slightly self-sufficient life but the one thing I was sure about once we had settled in (well about two hours after the move actually, just as we were unpacking the kettle…) was that I wanted ex-battery chickens. Why ex-battery chickens? And not one of the many fluffier, cuter, healthier, indeed more productive breed of chickens. Well…that brings us right back to compassion. Battery hens live in cages, four or five to a cage with space, per chicken, the size of A4 paper to live in. And chickens are surprisingly large, up close. There is not enough room for them to stand up straight or move around, they never see the light of day or feel the sun on their backs. They are not able to express natural chicken behaviour such as nesting, scratching, foraging, dust bathing or even stretching their wings. Cramped up in these cages they can start to peck each other (sometimes to almost baldness), so their beaks are trimmed, without anaesthetic. In 2012 these cages are due to be banned but, somewhat unsurprisingly, some European countries are dragging their feet. 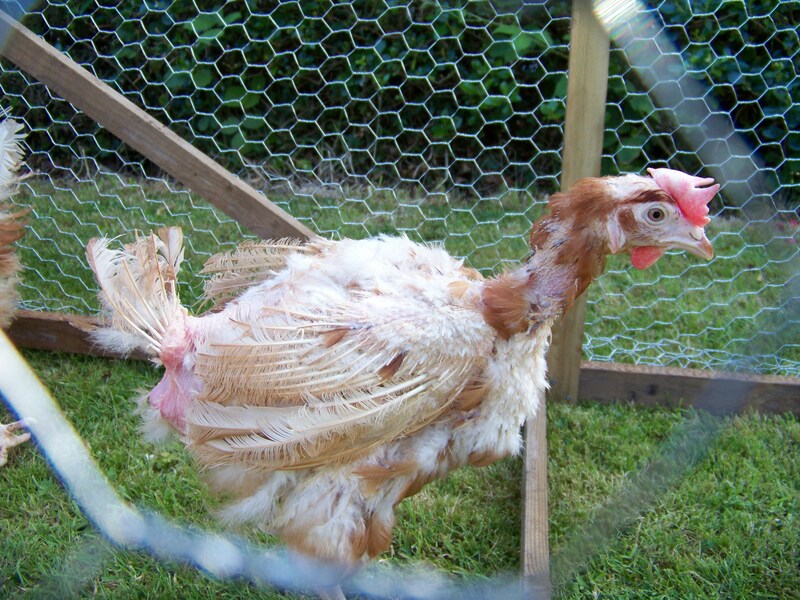 But I could rant for hours on the plight of our little battery hens, so to illustrate the effect living in these cages has on them, below is a photo of Audrey, one of my first ex-batts, the day we rescued her. It still makes me cry. But back to reasons for re-homing some ex-battery hens. Well, on a practical note they usually produce eggs from day one and are used to being handled, even by an over-enthusiastic novice such as myself. Within days their cheeky characters start to shine through and watching them revert to their natural chicken behaviour the intensive farmers had tried so hard to breed out of them, will warm even the hardest heart – in this case, my husband’s. They start to scratch the ground (trashing your veg beds, fence those off), dust bath and flap their stubby wings. Eventually their featherless areas start to get five o’clock shadow and they slowly lose that ‘oven-ready’ look. I spent days eagerly watching Audrey’s undercarriage slowly sprout feathers. In fact, I defy anyone not to have their spirits stirred by the sight of them running across the garden to you when it’s time for supper or be delighted by the startled look on their faces when they manage to take off for the first time or to find them performing their daily ablutions in a sun-warmed patch of bare earth. Chickens are the ultimate green machines. They eat your waste scraps, process them, deposit them to fertilize your land, rid your soil of nasty slugs and bugs and produce eggs. And if you are really canny, you throw a few seeds on the compost pile and let them turn that over for you! 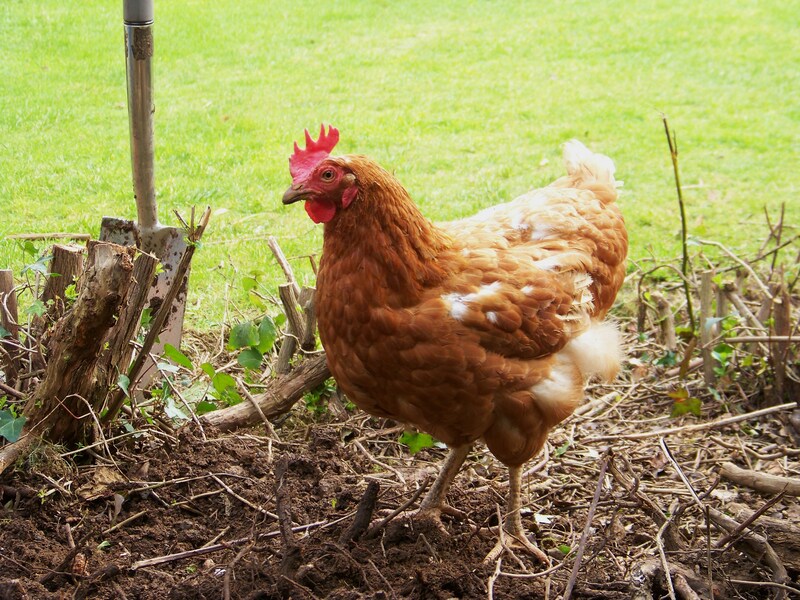 You don’t need much room for them, even a small town garden can accommodate a few chickens and you don’t need any experience to look after them. As I will prove to you over the coming weeks!! Just an interest in chickens and their welfare, a good reference book (absolutely anything by Katie Thear) and a smidge of common sense. Oh, and a love for eating eggs! Whilst I thought I was rescuing them and improving their lives, they in fact have added an unexpected element of pure, unadulterated joy to mine. I truly believe everyone should have chickens and they should be prescribed to anyone who suffers with any form of melancholy. Caring for them, watching them develop and loving them is addictive and provides sunshine for the soul.